August 20, 2018--As predicted in my July 10th post below, I did get the stitching on this beautiful purse done in August. Hurray! I'm seriously thinking about finishing it myself into a clutch purse and have found an old Vogue pattern (#8974) which might work perfectly as a guide. 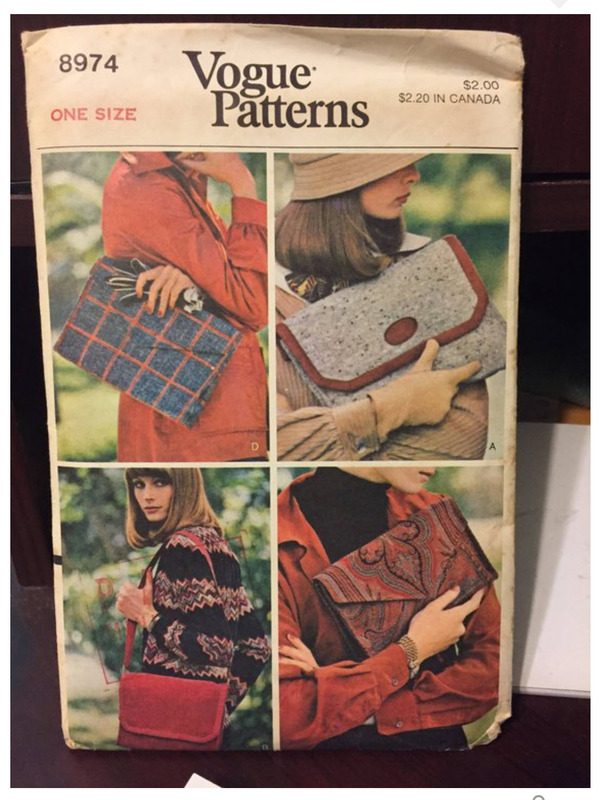 I originally contacted the shop who finished Janet Zickler Casey's model purse, but they are no longer doing this type of thing. So I either do it myself or try to find someone else to finish it (understand this type of thing is very expensive). I'm a DIY kinda gal (does this equate to fearless), so I'll give it a go myself. July 10, 2018--Yay! All the black diamonds are stitched and just a few white ones to complete. Maybe by the end of August, at the rate I'm going, they'll all be done. Then I'll have the fun of finding a purse "finisher". May 27, 2018--Still working on the diamonds--it's a very slow process. But I am making progress and hope to complete the stitching by the end of the year. Odds are out to see whether or not this happens, or if it gets done at all. LOL. January 7, 2018--I've been working on this purse off and on over the last few months. Over 25% of the diamonds are now filled in. Whew. Each diamond takes nearly two hours to stitch due to the fact there are two different stitches which use different threads that must be "laid". Also, this is a huge canvas - 14" x 22" and moving your hand around it takes time as well. In actuality, however, the purse is more than 25% complete since the beaded fleur de lys is in place, the diamonds are outlined in silver Kreinik, the beaded handle put together, and the black diamonds are painted in so that white canvas doesn't show through. November 2, 2017--Began stitching the diamonds. The lower right 2 rows are done. 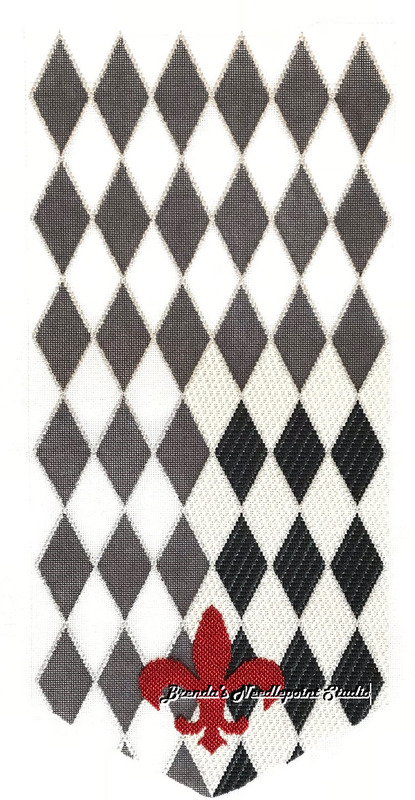 Not a difficult stitch, but each diamond does take time. A good project to stitch while watching TV. April 11,2017--Steadily working away on this project. 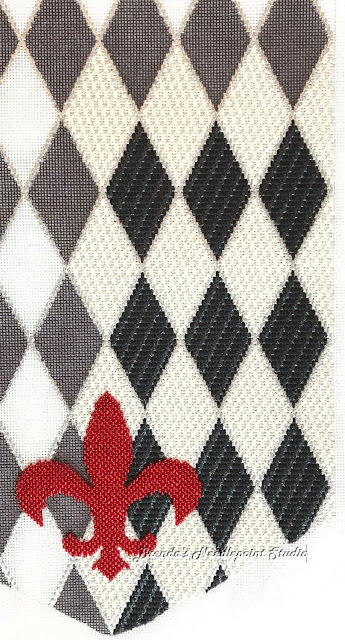 Finished stitching the outline of the diamond shapes in silver Kreinik, painted in the black diamonds so that white canvas won't peek though the stitches (no stitches done yet), AND, beaded the Fleur de Lis in "brick stitch" pattern. I'll wait until the end to add the black "tie down" beads on the Fleur de Lis. April 5, 2017--I started stitching this purse at the ANG 2016 Seminar in New Orleans, LA in a class taught by Janet Zickler Casey called "Let The Good Times Roll. This is a very large piece which will be made into an envelope clutch with a beaded handle. I spent much of the class time making the handle since my beading experience for items such as this is practically nil. It came out well and I hope some day to do more in the way of beading bracelets, necklaces, etc. Janet offered two colorways for this purse--black and white like the one I'm doing; Mardi Gras colors in green, purple and gold. Here's my progress to date and a picture of the handle. Here's the project photo. 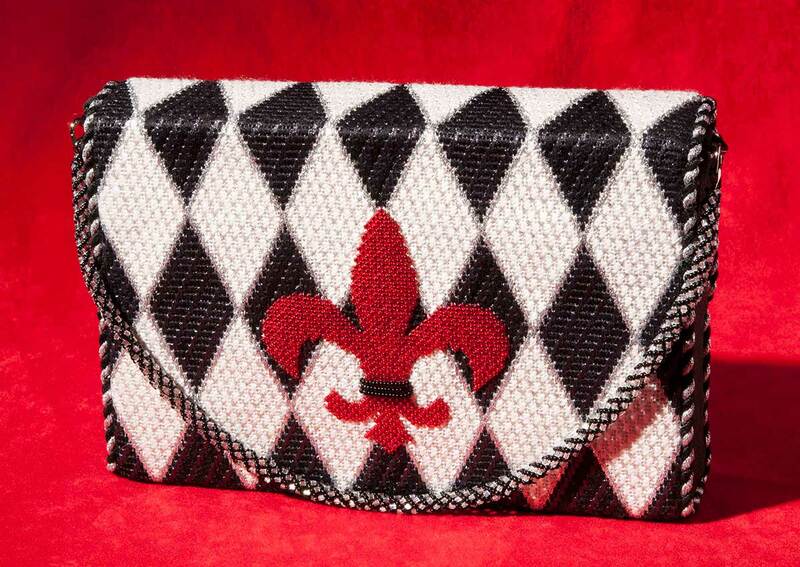 This picture shows the red beaded Fleur de Lis positioned on the back of the purse. Mine will be on the front. That will look lovely. Will you finish it yourself or take it somewhere to make it into a clutch? I'll probably have someone make it into a purse for me. I imagine myself carrying this while gambling in a casino. LOL. That'll be pretty. Only makes sense to have the fleur de lys on the front. and what paint did you use? brave of you to paint so close up to stitched threads. Used a black fine point permanent marker. Was easy to work around the silver Kreinik threads which have a little black running through them. This is going to be gorgeous! I can imagine it might be a bit tedious though! I fill in like that with permanent markers frequently, sometimes even after all stitching is done. No problems! Hi Liz, Sorry, I deleted your nice comment by mistake and am unable to retrieve it. Blogger is changing how I see comments (no longer going to my inbox) and the new viewing has options with which I'm not familiar.